Though they are not true lilies, callas have a similar elegance and equally spectacular flowers compared to any lily. And fortunately, they are easier to grow than most lilies - if you have the right climate and give them the basic care they need. 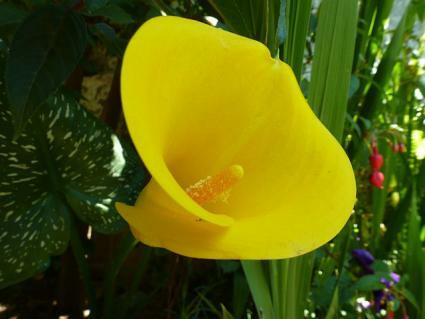 Calla lilies have large spade-shaped leaves, resembling the plant elephant ear to which they are related, that rise one to two feet in small clumps above their tuberous root systems. The flowers emerge on tall stalks rising about one foot above the foliage, unfurling into an exquisite funnel-shaped blossom that looks like something off the tip of an artists brush. 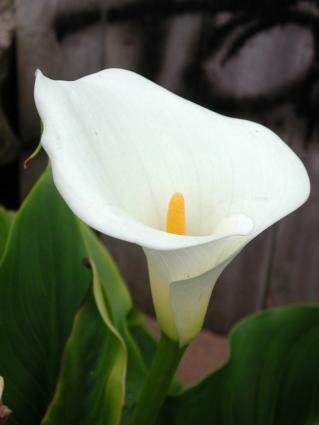 The flowers of the basic species of calla are pure white, but numerous hybrids have been developed that come in every color of the rainbow except blue. The white varieties bloom most prolifically in spring, while the hybrids bloom primarily in summer. The hybrids are also about 50 percent smaller than the species on average and are more temperamental to grow. 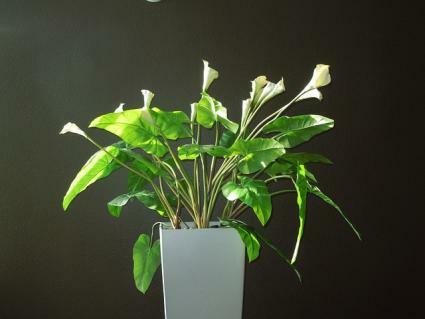 Plain white callas love full sun, ample moisture and cool weather. In very hot climates they tend to go dormant in summer, especially if there is not sufficient water. They also grow well in partial shade, which is a good place for them in really hot climates, though blooming will be reduced. They grow well where summers are relatively cool, such as foggy coastal areas, but they also need mild winters in order to be grown outdoors year round. In general, if winter temperatures in your area typically drop below 10 degrees, callas will need to be brought indoors in fall. 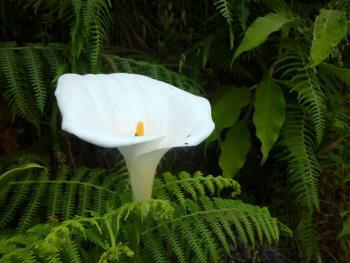 In the wilds of sub-Saharan Africa where calla lilies originate, they are found at the edge of streams and wetlands. Their lush appearance makes them a natural fit for plantings next to water features in the landscape or with other species that have large tropical-looking foliage. They are a good candidate for container gardens, as well, which is an especially good idea for cold climates so they can easily be brought indoors. In fact, they can be grown indoors year round in a bright sunny window, which is often a successful approach with the colorful hybrid varieties in particular. 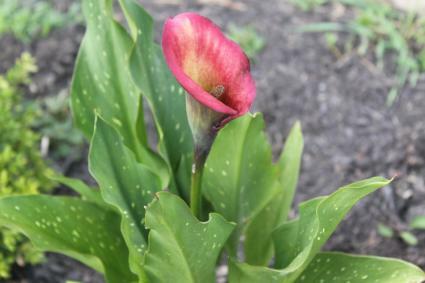 The best time to plant callas is in spring after all danger of frost has passed. Plant them in a bed that has been thoroughly amended with compost. The plain white callas can tolerate, even thrive, in places with poor drainage, but the hybrids need excellent drainage. If you're planting dormant tubers, they should go about 3 to 4 inches beneath the surface of the soil with the growing tips facing up. Plain white callas are very robust in their preferred climate and habitat and can actually become invasive, meaning you may spend your time controlling their spread rather than trying to help them grow. Outside of their ideal habitat, however, the main chore is to make sure the soil stays moist and that the roots are cool. They may need to be watered several times per week during a heat wave, though ideally they should have three to four inches of mulch spread over the soil around them, which helps to conserve moisture and keep the roots cool. Fertilizer is optional, but can result in more prolific blooms, especially for the hybrids. If you choose to fertilize, use a balanced, all-purpose fertilizer, such as 10-10-10. The main difference in caring for the hybrids is to not over water them. They like regular moisture, but unlike the white kind it's best to let the soil dry out a bit between waterings. Root rot is the only significant disease affecting callas. With the white kind, this is caused by excess heat. Moving them to a shadier location, watering frequently and maintaining a deep layer of mulch are the only real remedies. The hybrids are quite susceptible to root rot, but again, the only real solution is prevention - keep them moist but not damp and give them the coolest possible conditions. There are a profusion of colorful varieties available from specialty nurseries. While these are commonly seen in florist shops, beware that they are grown under highly controlled conditions in greenhouses. Most home gardeners prefer the easy-to-grow white variety, but here is a sampling of others if you want to try your luck. Black Magic has blossoms that are so deeply purple, they appear black. Flame has a combination of peach, orange and red shades reminiscent of a fiery sunset. Lavender Gem's flowers are the gorgeous shade of purple that its name suggests. Calla Lillie may not be extremely cold hardy, but compared to other plants with exotic-looking tropical flowers, they are incredibly easy to grow and are adapted to a wide range of climates. They make long-lasting cut flowers and the blooms are profuse, so there are usually plenty available to bring inside and enjoy in a large vase.